Preventive maintenance services of Commonwealth Chimney Sweeps in Harrisburg, PA are highly cost effective. Preventive maintenance is always more cost effective than repairs that could have been avoided. 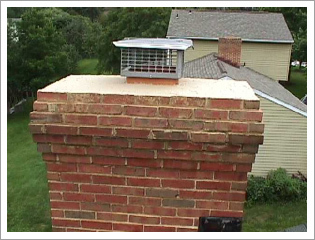 Annual inspections are critical for chimneys that are used regularly, but even if used occasionally, a chimney system (the appliance, any necessary connecting pipe and chimney itself) should be routinely inspected and cleaned if necessary. Let the experts at Commonwealth Chimney Sweeps in Harrisburg, PA take care of your chimneys at affordable prices. Could this be Your Chimney? 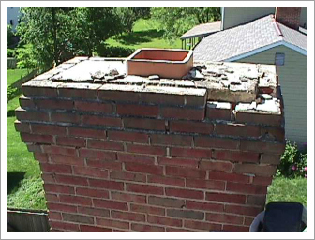 SEVERELY water damaged chimney, could have been caught sooner if inspected yearly. Or is this Your Chimney? 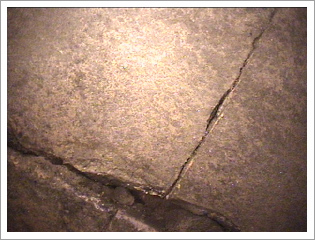 Above cracked flue tile picked up by camera after a chimney fire. Feel free to give us a call if you need more information about our chimney services.